An international mining group had many dissimilar and fragmentary approaches to risk management across its business units, arising from the series of acquisitions and mergers that had led to its formation. The group felt that its approach to risk management as part of safety and environmental management was well advanced. However, it needed a fresh, consistent and comprehensive approach for all forms of risk across all its sites, including newly acquired upstream assets. In particular the group approach should to address the risks associated with asset integrity, trading and treasury activities, as well as mining operations. The group asked Broadleaf for practical advice on how to develop and enhance a suitable framework for managing all risks consistently (sometimes called enterprise risk management, or ERM) across its operations. We suggested that this should be based on a critical evaluation of the elements already in place and should be informed by what is generally regarded as good practice in the resources sector. The entire project was spread over a year. Broadleaf supported the group until it felt confident in its own leadership of the changes required. Based on considerable experience, we believe that the most efficient and effective approach to developing a new framework and the associated implementation plan involves, broadly, using a gap analysis as an input to a management of change process. This is depicted in the Y Model shown in Figure 1 and described below. A clear commitment to the plan and its implementation through the allocation of suitable resources by senior management and by their continued oversight of progress. These steps can be tackled separately and the results reported to senior management. However, the most efficient approach, and the one that gains the greatest degree of ownership and endorsement, is to involve representatives of senior management in all these steps over a short space of time. Broadleaf facilitated a two-day, intensive workshop that covered the five steps described above with a group of champions drawn from across the business. The workshop involved a series of modules that briefed the participants, facilitated gap analyses, developed a blue print for the framework, devised tools, wrote a policy statement and developed the implementation plan. The outline agenda for the workshop is shown in Table 1. The workshop was based on ISO 31000:2009, as this provides the most widely used, up to date and comprehensive prescription for a framework for managing risk. The international standard has also been adopted widely as a national standard in many countries, including most locations where the group had operating assets. An appreciation of the fundamental terms and concepts behind effective risk management. This includes how an organisation can build and develop its capacity to manage risk. How the risk management process supports decision-making. 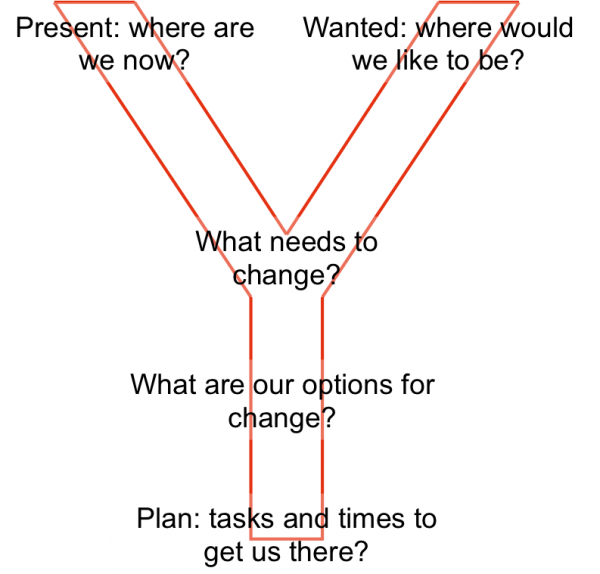 An understanding of the process for integration. Agreement on the wanted situation, the design intent of the framework. A clear definition of the current situation. Acceptance of what needs to change. Agreed, tangible tasks to lead to an enhanced framework. The basis for a risk management toolkit for the group. This required further detailed development after the workshop. Draft policy for review and endorsement by the Management Committee. Agreed process to steer and monitor progress on the implementation of the plan. The evaluation and gap analyses (module 3) used protocols and tools supplied by Broadleaf. Description of the desired governance and oversight arrangements. 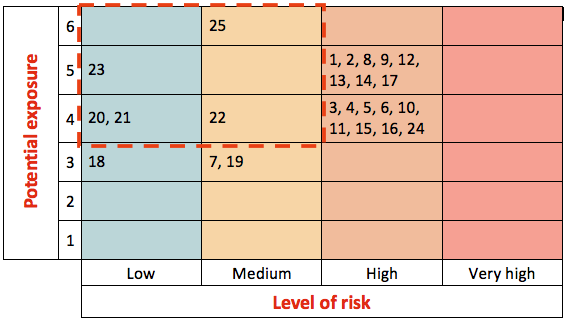 Broadleaf prepared a guideline that included the risk rating system developed previously. It also included a range of templates and tools and described a process for establishing the context, conducting a risk assessment and developing risk treatment plans. This guideline, tools and templates were used as the basis of the subsequent training course. This took place over four days and included many practical exercises including a half-day group case study. It was held twice, in Europe and North America. The training objective was to equip champions with sufficient skills to facilitate risk assessments and help their management teams start integrating the group risk management process into decision-making processes at their sites. Broadleaf supported the group with the rollout of the framework at two locations in Europe and North America. The objective was to demonstrate the application of the concepts and tools introduced to champions in the training courses and to trial the process for risk assessment and treatment in the guideline. Explain, in particular, how the risk management process was to be used in future in support of the group planning and sustaining capital programs. Broadleaf led two engagement exercises, one at a smelter and one at a mine site. The group risk manager and champions participated at each site so there was a transfer of skills. A close out presentation to management that confirmed what had been found and the next steps required by them. The close out presentation included the results of risk analyses, such as those shown in Figure 2, Figure 3 and Figure 4. 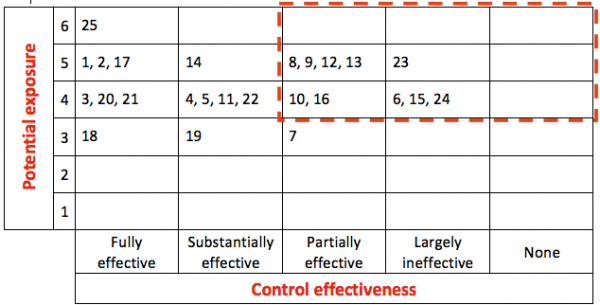 The numbers in the matrices are the identifiers for the risks. Sites were also provided with a risk management enhancement plan for the next 12 months. An outline plan is shown in Figure 5. After many years and projects of a similar nature, it is clear to us that a contractor should not ‘do risk management’ for a client. Our role must be to facilitate the process, to help our client’s staff understand and adopt good practice, not to do all the work for them. As the first part of engagement and roll out of the new framework at a site, provide basic training to managers on the fundamentals of risk management. At the request of the board, Broadleaf carried out an independent review of the current framework, strategy and process for managing risk in a major international commercial organisation. We were asked to provide our professional opinion on the current situation and to give advice on any further steps that should be taken to enhance and improve the foundations for risk management.